Every Friday afternoon at the Great Hall of the International House, a number of students and faculty attend the International Friday Café. Sponsored by the I-House, the event lasts till 1 p.m, and the cost is $5 to pay for each week’s delicious cuisine. The first International Friday Café was held on February 13, 1981 and has come a long way since then. Nonetheless, Jackie Soong, the programs and communications coordinator at the International Center at UC San Diego, believes the values it stood for from the beginning remain today. “The conception of the Café was a great opportunity for the members of the domestic and international campus communities to meet together, share stories, and mingle over food from around the world,” Soong said. The food is catered by Housing Dining and Hospitality, and it is highly praised by all attendees. Past meals from fall quarter have hailed from Germany, Panama, Ethiopia, Vietnam, and Mexico. The International Café on November 17 featured food from India. Attendees and engineering graduate students Lorraine Hossain and Laura Narimatsu went to the French Friday Café last year and were happy to return and describe the menu. Soong’s favorite cuisine so far has been the Ethiopian menu of Ethiopian chicken stew, beet salad, Ethiopian potato and chickpea stew, and chocolate cake with cinnamon whipped cream. She had never before tried it. For her, the best part about the event is seeing students and faculty socialize while enjoying the food and entertainment. 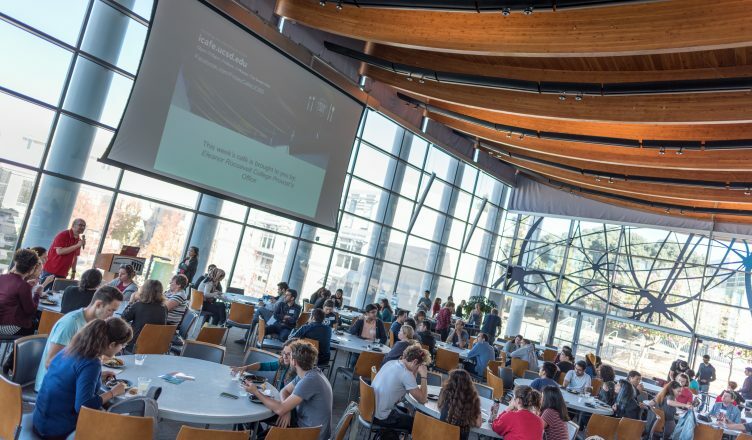 “You get to see faculty, staff, and students from different cultures and backgrounds come together in this one communal space, and watch them learn about a featured country — a truly enriching experience,” Soong said. Students, faculty, and visitors alike sat at the many round tables around the Great Hall, and everyone wears a nametag at each event to encourage conversation. Attendees seem a bit shy to introduce themselves at first, but as the food is served, conversation flows. The events often feature presentations about the cultures of countries of the day, the study abroad program, and more. About halfway through the event, the Café’s cultural ambassador for the day talked about the false stereotypes about Indian culture. He detailed the nation’s plans to spread education to the poorest parts of India in order to help them keep up with the rapidly developing country, as well as the rich cultural values they foster and their pride in being a welcoming country to visitors. Everyone listened attentively as they enjoyed their meal. Allyson Llacuna, a sophomore cognitive science design and interaction student from Sixth College, works as an event assistant for the International Friday Café. She works with audio technology and assists visitors when they need it. She has had a chance to try the food, and her favorite cuisine to taste so far has been from Panama and Mexico. Toward the end of the event, the announcer revealed that there would now be a fashion show showcasing different countries’ styles of dressing, eliciting “oohs” and “aahs” of excitement from the audience. Models from different countries came out wearing their native attire, beginning with Mexico and ending with China. As the women wearing saris from India walked the “runway,” the audience learned that there are more than 80 ways to wear sari. When the model from France came out, the announcer described French fashion’s progression in style from that of Coco Chanel to Jean-Paul Gaultier, as well as the history of the popularity of the beret. Models also displayed classic Spanish flamenco dresses and Japanese kimonos in varying seasonal designs. Llacuna’s music, which was coordinated to the country being presented, switched as new models from different countries took the stage. Hearty applause accompanied the end of the show, and the models came out for a bow, their faces aglow with the excitement of the animated reception. Soong has further plans to develop the entertainment side of the Café. Perhaps most exciting about the International Friday Café is the celebration of so many cultures at once. Though it is one country that is featured each week, the inclusion and acceptance of all cultures at all times is apparent. The Café also gives international students a welcoming place to share their backgrounds and feel more at home with other students who also came to school from far away. Every person part of the Friday Café is welcoming — a real testament to its theme. No one is excluded, and international students are never made to feel as if they don’t fit in. Attendees gesture to ask others to sit down with them, staff show guests to their seats, food servers answer questions about the cuisine and encourage everyone to try it. Guests learn not only about the delectable food they’re eating but the country it hails from as well. Hossain and Narimatsu agree — and they’ll be back. A respect for the multicultural society that breeds diversity is clearly the focal point at the International Friday Café. The I-House puts on other events to reinforce that philosophy, such as their global forums. One of the event coordinators encouraged attendees to check out the Language Conversation Tables for a chance to speak with others in one’s native language, to get some practice with a second language, or simply to learn about other cultures. For those looking to explore another culture, broaden their minds to the diversity on campus, or try some authentic foreign cuisine, the International Friday Café is a great opportunity to broaden one’s cultural taste palette. It’s a chance to meet new people, learn more about a variety of cultures, and celebrate the diversity that makes the UCSD community so vibrant.